Our group is actively engaged in understanding the viral biology in relation to its clearance and persistence by studying various aspects related to viral replication, viral genomics and the role of immune response. In India, the prevalence of chronic HBV infection in pregnant female is 0.82% (4) and during pregnancy, hepatitis B virus infection presents the risk of mother-to-child (vertical) transmission. 15-40% of HBV infected patients would develop cirrhosis, liver failure, or HCC. 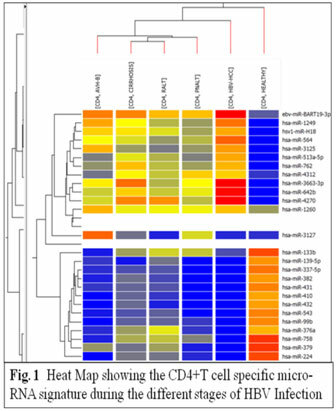 Our work has revealed (Trehanpati et al 2009, 2011, 2012) that during acute HBV (AVH-B) and chronic HBV (CHB) infection in adults; CD4+ T cells display distinct gene signatures between the two different modes of infection. In the study on adult CHB under treatment with antiviral therapy, we found that the frequency of FoxP3 expressing Tregs in blood decreases along with a decrease of viral load in eAg+ve patients. It was also observed that FoxP3 expressing CD4+CD25+regulatory T cells have a role in setting up of chronicity in HBV patients with cirrhosis and HCC (Fig. 1). Fig. 1: Immune regulation with antiviral in HBV infection. A-B. In adult CHB patients under treatment with antiviral therapy, the frequency of Tregs in blood was found to decrease along with the decrease of viral load. C. Normal liver showing low expression of FoxP3 protein in comparison to chronic hepatitis B, cirrhosis and HCC tumor tissue. Our work highlights the key role of Notch and TGF-β signaling in generation of antigen specific regulatory T cells. During cirrhosis and further in HCC enhanced the expression of these key molecules is associated with increased emergence of FoxP3 regulatory T cells, which probably contributes to the chronicity and fibrogenesis (Fig. 2). In a preliminary study on newborns, we have found that FoxP3 regulatory T cells are high in HBsAg+ve neonates born to HBsAg+ve mothers. Furthermore, HBsAg+ newborns were found to display reduced B cell population. Our data suggests that perinatal HBV infection might globally affect the immune system in newborns and continuous exposure of the HBV in utero leads to defect in phenotype and functionality of T cells. Our aim is to dissect why few HBsAg+ve neonates born to HBsAg+ mothers resolve HBV infection while in others it persists. We hope our ongoing studies may help in future to resolve this issue for better management of the neonates with persistent infection. The outcome of persistent infection by HBV and development of liver disease are determined by viral /host factors.. In this regard microRNA (miRNA) control has emerged as a critical regulatory principle in the mammalian immune system. Therefore, our aim is to identify regulation of various miRNAs and their target genes during hepatitis B viral infection, which will provide new insights to study the host-pathogen interactions and the mechanism behind viral persistence. We undertook a study to determine the miRNA profile of CD4+ and CD8+ T cells from liver biopsy samples from healthy control, Chronic HBV-infected patients HBV-cirrhotic patients and HBV related HCC patients (Fig. 1). We are currently in the process of analyzing the microRNA expression signatures using classification algorithms such as DT (Decision Tree), NN (Neural Network) and SVM (Support Vector Machine), to find predictor genes and biomarkers which potentially can be used for diagnostic applications. The treatment of chronic HBV infection includes intereferons, nucleoside and nucleotide analogs. The efficacy of these agents is limited, and their use is associated with side effects and emergence of drug resistance. Medicinal plant formulations and other phytochemical compositions have been used for generations as anti-viral agents, although scientific investigations have been lacking in their efficacy and mechanism of action. Several of these phytochemicals have complementary and overlapping mechanism of action, including anti-viral effects by either inhibiting the formation of viral DNA or RNA or inhibiting the activity of viral reproduction. In view of this a primary goal of our study is to identify herbal drug and its active components in inhibiting the HBV replication in hepatic cells, either directly or indirectly by affecting the host factors, using both an in vitro and in vivo approach. Monoherbal compounds from species well-known in ayurvedic system of medicine, Phyllanthus amarus, Andrographis paniculata and Sillybum marianum are currently under investigation at ILBS. Initial analysis of the effect of these phytochemicals on expression of protective proteins like NFkB, COX2, PI3K/Akt, MAPK, or ERK has provided promising results. Some of the compounds like sylimarin and phyllanthin have shown to behepatoprotective potential. On the other hand compounds like andrographolide are proving to be effective as antiviral. Investigations have revealed that the phytochemicals have lesser cytotoxicity to the host cells than the more popular tenefovir, lamividin, adefovir, telbivudin and entecavir (currently being employed for the treatment of chronic hepatitis B). Recent studies have demonstrated that these phytochemicals have the potential to reactivate anti-tumor protein p53. This has far reaching consequences in chronic HBV and hepatocellular carcinoma treatment. Chronic infection with hepatitis C virus (HCV) is a major cause of cirrhosis, liver disease, and hepatocellular carcinoma. The group is particularly interested in developing replicon system of HCV viral genome 3a which is an important tool, especially in Indian perspective where more than 80% of HCV patients are infected with this genotype. Replicons are required to determine the impact of mutations for drug resistance, but also to develop phenotypic resistance assays similar to those described for HIV or HBV. Such tools may be helpful to optimise treatment regimens. HCV replicons may also be instrumental in better understanding the mechanisms underlying IFN-a mediated inhibition of HCV replication and to identify viral and host determinants of IFN- a resistance. There is also the possibility to produce infectious virus particles using HCV replicon system. This system will offer a new way to evaluate the role of neutralizing antibodies present in chronically infected patients. We have succeeded in making both sub-genome and full genome construct of HCV genotype 3a virus. Unlike west, in India infection with Hepatitis E is a major health concern. High mortality is associated with HEV infection during the third trimester of pregnancy. And additionally vertical transmission to newborns is also a major cause of concern. Approximately 50% of acute viral hepatitis in young adults and in pregnant women is due to Hepatitis E virus (HEV) infection in developing countries. Hepatitis E is self resolving viral infection, however, in pregnant females, HEV infection can be serious. Nearly, 70-80% pregnant women clear the virus after HEV infection; however, in 20-30%, HEV infection can become fatal. HEV can also induce chronic hepatitis in immunosuppressed patients. T cell mediated immune injury probably plays a key role in the pathogenesis of acute hepatitis illness (Trehanpati et al 2011). During efficient host response, dendritic cells (DCs) and macrophages sense HEV through TLRs and secrete chemokines thereby activating the T cells which get recruited in liver.